The leaking of the newest IAEA report on the Iranian nuclear program has predictably sent the media into a fear-mongering frenzy. The Jerusalem Post giddily reports that the IAEA says "the Islamic Republic was working to develop a nuclear-weapon design and was conducting extensive research and tests that could only be relevant for such a weapon." 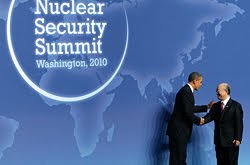 The New York Times' Sanger and Broad published a story entitled "U.N. Agency Says Iran Data Points to A-Bomb Work," The Washington Post's Joby Warrick noted the exposure of "secret nuclear research by Iran," Reuters' Fredrik Dahl and Sylvia Westall reported that "Iran appears to have worked on designing an atomic bomb and may still be conducting secret research," Ha'aretz's Yossi Melman declared that "Iran has been working toward building a nuclear weapon since 2003," and Associated Press' George Jahn wrote that "the report by the International Atomic Energy Agency is its most unequivocal yet suggesting that Iran is using the cover of a peaceful nuclear program to produce atomic weaponry." The Guardian writes that Iran "may be researching nuclear warhead", the BBC said Iran is "studying nuclear weapons", the Financial Times got in on the action by stating that "Iran has sought to design a nuclear warhead and has continued to conduct research on an atomic weapons programme," the Los Angeles Times reported that "credible evidence indicates Iran may be secretly working to develop a nuclear weapon," while CNN posted headline "Iran developing nuclear bombs," despite going on to report that the IAEA has "found no evidence that Iran has made a strategic decision to actually build a bomb." Even IPS, a wire service that rarely echoes the histrionics of other outlets, ran a piece by Barbara Slavin claiming that the new report "provides substantial evidence that Iran carried out extensive research into how to make a nuclear weapon prior to 2003," which provides a platform for the leaders of the hawkish Conference of Presidents of Major Jewish Organizations to insist that "[t]here can no longer be any doubt about the intent or direction of the Iran nuclear weapons effort, which is progressing rapidly." They also claim that the "report leaves no room for ambiguity and demands a quick, comprehensive plan in which all options are included," code for an aggressive military attack. Curiously, as of this writing, Commentary's Michael Rubin has so far stayed away from actually commenting on the report, posting only some excerpts from the document instead, and The Weekly Standard has yet to weigh in at all. Anyone familiar with the history of IAEA reports on Iran will find very little in the way of revelation in the 13-page "bombshell" that everyone seems to be freaking out about. It's big on fluff, weak on substance. Most of the allegations, described at great length and in minute detail, are are resurrected claims, the so-called "alleged studies documentation" - long known to rest somewhere on the spectrum of dubious to fabricated - gleaned from a mysterious, stolen laptop. Because of its questionable origin and authenticity, the IAEA has consistently shied away from giving such information much credence. Incidentally, the words "alleged," "allegation," and "allegedly" appear nearly 30 times in the new report. As a result, the agency has in the past been accused by "senior Western diplomats and Israeli officials" of "hiding data on Iran's drive to obtain nuclear arms." In response to allegations that the IAEA might delay publication of its periodic safeguards report on the Iranian nuclear program because of internal disagreements over the authenticity of supposedly damning information, a senior IAEA official close to the Director-General countered, "Reports about disagreements within the agency over the forthcoming Iran report are nonsense" and accused those making such claims of "hidden agendas" and pushing the same "hype" that preceded the invasion of Iraq. "If the facts are at odds with the policy objectives of some people who are keen to impose further sanctions on Iran, that's too bad," the official said. Regrettably, time and again unidentified sources feed the media and Member States with misinformation or misinterpretation. This time around, there are articles claiming that the Secretariat is hiding information, and that there are sharp disagreements among staff members involved about the contents of the report. Needless to say, such allegations have no basis in fact. IAEA chief Mohammad ElBaradei also countered this claim at the IAEA governors' meeting in Vienna on September 7, 2009, saying, "I am dismayed by the allegations of some member states, which have been fed to the media, that information has been withheld from the Board. These allegations are politically motivated and totally baseless." He added, "Such attempts to influence the work of the [IAEA's non-proliferation inspectorate] and undermine its independence and objectivity are in violation of...the IAEA Statute and should therefore cease forthwith." With respect to a recent media report, the IAEA reiterates that it has no concrete proof that there is or has been a nuclear weapon programme in Iran. The Agency receives information from a variety of sources that may have relevance to the implementation of safeguards. All such information is critically assessed by a team of experts working collectively in accordance with the Agency´s practices. The IAEA reiterates that all relevant information and assessments that have gone through the above process have already been provided to the IAEA Board of Governors in reports of the Director General. In October 2009, the IAEA "admitted that some of the material in the now-infamous 'secret annex' about Iran's nuclear program exists, but claims it wasn't verifiable enough to release." Josh Rogin of Foreign Policy reported that "the classified information...was collected as part of the IAEA's annual volume on Iran but never made the final cut" due to the fact that IAEA authorities "decided they weren't confident in the authenticity of the information contained in the extra document, and they couldn't verify what that research had found." Shortly thereafter, ElBaradei explained, "The IAEA is not making any judgment at all whether Iran even had weaponisation studies before because there is a major question of authenticity of the documents." It appears that IAEA Director General Yukiya Amano, the U.S.' man in Vienna (and self-declared as "solidly in the U.S. court on every key strategic decision"), who in 2009 said, "I don't see any evidence in IAEA official documents about this," when asked whether he thought Iran was seeking nuclear weapons, has decided to change his mind. Maybe a secret visit to the White House less than two weeks ago "to meet top officials of the National Security Council about the coming report" had something to do with it. For its part, the IAEA does its best to sound serious. By way of introducing the supposedly damning "Annex" section of its new report, the IAEA purports to having obtained "a large volume of documentation (including correspondence, reports, view graphs from presentations, videos and engineering drawings), amounting to over a thousand pages," documentation "of a technically complex and interconnected nature, showing research, development and testing activities over time." The report concludes, "The information which serves as the basis for the Agency’s analysis and concerns, as identified in the Annex, is assessed by the Agency to be, overall, credible." The insertion of the word "overall" and without going into specifics about which documents were verifiable and which were not is but one indication that the IAEA itself may not be wholly buying what it's trying to sell. Additionally, at the beginning of certain subcategories of the detailed "Annex", the report gives brief explanations of various aspects of nuclear weaponization, information that one would expect any member of the IAEA Board of Governors to already know. For example, the section about "Nuclear components for an explosive device," opens with this tutorial: "For use in a nuclear device, HEU retrieved from the enrichment process is first converted to metal. The metal is then cast and machined into suitable components for a nuclear core." The next section, labeled "Detonator development," begins, "The development of safe, fast-acting detonators, and equipment suitable for firing the detonators, is an integral part of a programme to develop an implosion type nuclear device." The section marked, "Initiation of high explosives and associated experiments," explains that "Detonators provide point source initiation of explosives, generating a naturally diverging detonation wave. In an implosion type nuclear explosive device, an additional component, known as a multipoint initiation system, can be used to reshape the detonation wave into a converging smooth implosion to ensure uniform compression of the core fissile material to supercritical density," while the "Hydrodynamic experiments" section begins, "One necessary step in a nuclear weapon development programme is determining whether a theoretical design of an implosion device, the behaviour of which can be studied through computer simulations, will work in practice." Introductions like these to sections heavy on technicalities and minutiae give the impression that the intended audience for this report is not a panel of experts and Agency ambassadors familiar with nuclear physics, but rather a malleable media and a gullibly alarmist public. Whereas a lot of ground already covered regarding allegations of weapons research before 2003 is rehashed in the report, there is little in the way of new charges. In fact, the IAEA admits, "The Agency's ability to construct an equally good understanding of activities in Iran after the end of 2003 is reduced due to the more limited information available to the Agency." The report cites information provided by two unnamed member states (Palau and Vanuatu, perhaps?) claiming that in 2008 and 2009, conducted studies involving "the modelling of spherical geometries, consisting of components of the core of an HEU nuclear device subjected to shock compression, for their neutronic behaviour at high density, and a determination of the subsequent nuclear explosive yield." The IAEA says "[t]he application of such studies to anything other than a nuclear explosive is unclear to the Agency." If true (there are is no source material or footnoted reference available for this particular claim), it's curious to note that the same year, IAEA head Mohammad ElBaradei told the press in Washington D.C., "I have not received any information that there is a concrete active nuclear weapons program going on right now." In February 2008, a senior IAEA official close to ElBaradei decried the politicization of the Iranian nuclear file. "Some people do not want to see the Iran issue resolved because that would contradict their hidden agendas," he said, adding that "people should have learned from their mistakes in the past, when all the hype over alleged weapons of mass destruction in Iraq turned out to be just that -- hype." The official also stated clearly that, while IAEA "inspectors are still working on clarifying the facts about the alleged weaponization activities in Iran," "[i]f the facts are at odds with the policy objectives of some people who are keen to impose further sanctions on Iran, that's too bad." Shortly thereafter, ElBaradei told the IAEA's 35-member Board of Governors, "We have managed to clarify all the remaining outstanding issues, including the most important issue, which is the scope and nature of Iran's enrichment programme." In September 2009, the IAEA "reiterated that the body has no concrete proof that Iran has or has ever had a nuclear weapons programme," and a month later, ElBaradei said, "I have been making it very clear that with regard to these alleged studies, we have not seen any use of nuclear material, we have not received any information that Iran has manufactured any part of a nuclear weapon or component. That's why I say, to present the Iran threat as imminent is hype." One wonders what makes the 2007 interview with the "member of the clandestine nuclear supply network" so compelling now. Despite all the allegations and supposed evidence found in the latest report, the IAEA still "continues to verify the non-diversion of declared nuclear material at the nuclear facilities and LOFs [locations outside facilities, all of which are situated within hospitals] declared by Iran under its Safeguards Agreement," as it has numerous times a year for nearly a decade. This verification, as affirmed in Article 2 of the IAEA's 1974 Safeguards Agreement with Iran, is the agency's "exclusive purpose" with respect to the Iranian nuclear program. Overall, the release and subsequent fallout of this report, as has been the case so many years now with similar attempts to stoke fear about Iran, feels a lot like this scene from the 1983 John Landis film Trading Places, with the United States and Israel in the role of Louis Winthorpe III (Dan Aykroyd) and Iran as Billy Ray Valentine (Eddie Murphy). Unfortunately, it appears IAEA Director General Yukiya Amano, whose independence and credibility may be irreparably damaged due to his decision to kowtow to Western demands and provide ample fuel to the warmongers' fire, is unaware that "it ain't cool being no jive turkey so close to Thanksgiving." November 9, 2011 - A far more comprehensive and impressive analysis than mine has been written by the venerable Dr. Muhammad Sahimi over at Tehran Bureau. 11.08.11 - Of "Soviet Nuclear Scientists" and "Steel chambers" - the "aluminum tubes" lie recycled for Iran? 11.08.11 - IAEA report on Iran: more of the same, more hype. "He is a mystery man," an official, who declined to be named but is from a country which accuses Tehran of seeking to develop atomic bombs, said. So, the anonymous "official" from a secret country that accuses Iran of nuclear weapons work (a country that no doubt has its own stockpile of about 400 unmonitored, undeclared nuclear warheads and has been tirelessly trying to scare the world about the looming specter of an atomic Iran for three decades) is calling an Iranian scientist a "mystery man"! How spooky! Great work, Mr. Dahl, as usual. You are nothing but a shill for the Islamic Republic. All you do is defend this regime at every instance you get - while being a blind anti-American when you should value the ideals of freedom and democracy that constitutes western secular nations. How dare you compare the "Occupy" movement as any way comparable to the freedom movements, particularly in Iran? In one, thousands have died and are imprisoned in Evin or other secret prisons. In the U.S., one can protest as it is their constitutional right, but they are not allowed to shut down roads, bridges, businesses etc. In addition, why should they be able to set up camp to stay there for months? Protest like civilized human beings. Unfortunately, most of these individuals that remain in the 'Occupy' movement tend to be of the most radical elements of U.S. society and of course they too, like you, don't appreciate the freedoms and rights we are afforded in the west. Only those such as you who were not born in Iran or have not spent considerable amounts of time in Iran can spit at the face of freedom which stands right above your ungrateful face. Your shrill contempt for the Occupy movement reveals your silliness and duplicity. Your obsession with American exceptionalism is also misguided. Thank you for making incoherent blanket statements that have no bearing on anything I've actually ever said or written and for not addressing anything at all in the post you've commented on. You're a champ. You're a disgrace to all freedom loving Iranians. sasss31 It is truly ironic, but if there is a downfall of this country it will be due to people like you and your fascism attitude of low information and ignorance. Nima is right, you are wrong. CBSs Mike Wallace got an Emmy about 5 yrs ago for an interview with Iran president Ahmadinejad, where CBS left out the most important points he made, but C-Span left out nothing and recorded the whole conversation that showed CBS leaving out the points he made. The US does not own the concepts of freedom and democracy, but folks like you&your Rethugnut friends will do all you can to destroy it. The US does not own truth either. Not a Rethugnut? I don't care, you sound off like they do.